Drowned to death? 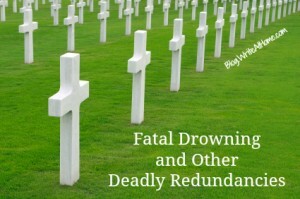 A fatal drowning? Yes, those are redundant expressions. Drowning, by definition, means “dying by being underwater and unable to breathe.” But this kind of error isn’t uncommon in publications. Keep an eye out for this kind of deadly redundancy and get familiar with these other potentially misleading words. Assassination is always deadly. It is the murder of a person of political importance. As I said, drowning always implies death by submersion in water. People often use drown in a non-literal way, however–as in drowning one’s sorrows or drowning in work. Electrocution implies death by electricity. If the victim is non-fatally injured, he was simply shocked. Homicide is another word for murder and by definition results in death. This is true of all the –cides: genocide, patricide, algaecide, etc. People can die of starvation, but they can also merely suffer from it. It’s not redundant to say someone starved to death. Strangling or strangulation means to kill by squeezing the throat, but the word is often used in a figurative sense, so it’s not always apparent that someone who has been strangled is dead. Suicide means self-killing. If the attempt fails, it is called attempted suicide. Suicide, however, can be used figuratively as well. There is a non-literal way to use this word. You can say, for example, that the air in a room is suffocating (especially after I remove my shoes). Asphyxiation, on the other hand, just means one stops breathing. It can result in death, but it doesn’t have to. Feel free to leave any killer comments below. Algaecide is a word? Wow, I learned something new today. I (and several dictionaries) would like to dispute electrocution. It can refer to non-fatal injury. Shock is too vague as that can be a medical condition having nothing to do with electricity. Point taken, but after some research, I’m sticking with it. Merriam-Webster, Dictionary.com, and American Heritage all list only “death by execution.” The OED and Google dictionary includes the idea of injury by electricity. The word was formed in America in the mid-1800s as a portmanteau combination of “electricity” and “execution.” It was shorthand for execution by electric chair. This doesn’t mean the meaning can’t change over time, of course, but I’m still recommending that writers assume “electrocute” implies death. I disagree that “shock” is too vague. In its literal sense, it’s quite clear and can be reinforced as “electric shock” if there is any doubt.